15/01/2018 - Shrine of Madonna del Ghisallo between the two branches of Lake Como. There are places in the world that boast to be the spiritual home of cycling: the Shrine of Madonna del Ghisallo is one of these places of cycling . It lies at Magreglio (in Province of Como) between the two branches of Lake Como. Is't venerated by international cycling as patroness of cycling and the place has become the focus of many riders' pilgrimages . There are also great views from here over Lake Como. From Bellagio on the shore of Lake Como there’s a 500-metre (altitude) climb to the shrine. The climb forms part of the Giro di Lombardia (average gradient is 9 per cent). There are also great views from here over the lake. Tour of Lombardy or “Il Lombardia” , is a cycling race in Lombardy for professionals . Giro di Lombardia is traditionally the last of the five 'Monuments' of the season considered to be the most prestigious one-day races in cycling (Milan–San Remo in Italy, Tour of Flanders in Belgium, Paris–Roubaix in France, Liège–Bastogne–Liège in Belgium) and one of the last events on the UCI World Tour calendar. Nicknamed the Classic of the falling leaves or “the Classica delle foglie morte”, it is the most important Autumn Classic in cycling . According to legend in mediaeval times, a local nobleman was being attacked by bandits when he saw an apparition of the Virgin Mary, and running towards this vision saved him. Thus, the Madonna del Ghisallo became the patroness of travellers. Then, in 1949 a local priest managed to persuade Pope Pius XII to admit her as the patroness of cyclists. 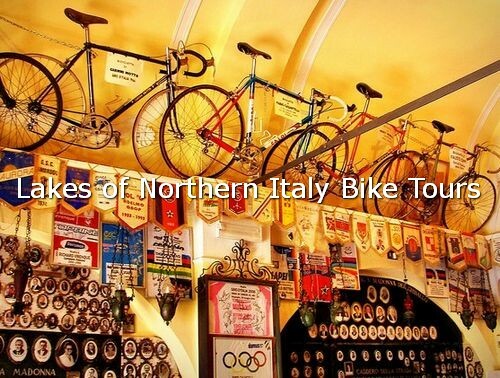 The walls of the shrine are almost covered in pennants of cycling clubs from all over the world, jerseys from champions of the recent and distant past, and most prominently, a selection of bikes that have made history. Inside the shine you can see the bikes ridden by Gino Bartali, Fausto Coppi, Eddie Merckx, Felice Gimondi, Gianni Motta, Francesco Moser in their victories, as well as a collection of pink, yellow and rainbow jersey from several former pros and other memorabilia. You can also see the crumpled bike of 1992 Olympic champion Fabio Casartelli – the one that he was riding when he crashed on the descent of the Col de Portet d'Aspet during the 1995 Tour de France. Casartelli was from nearby Como, and his death is still mourned greatly by fans in the area, the bent forks of his bike tell the story of his tragic end. Next door to the Shrine of Madonna del Ghisallo is the cycling museum. The museum is housed in a modern spacious well-lit building and it presents the history of cycling looking at some of the key events and players within the sport. The cycling museum is devoted to the men and women who have used and continue to use the bicycle in everyday life and in sports, but also to all those people whose work revolves around cycling, and competitive racing in particular: the athletes, bicycle manufacturers, organisers, sports club directors and journalists.